Not to be confused with Hays, Kansas. W.W. Hays came to this area in the early 1870s. In 1891, he platted land that he owned so a town could be built. The Haysville State Bank was established in 1919. Truck farming supported a lot of the families in the area. In 1874 a grist mill was built on the bank of the Cowskin to process corn that was harvested in the area. Haysville's first school was built in 1876 at a location that may have been near what are now the Water Department facilities. Haysville appears in Colton's New Sectional Map of the State of Kansas as early as 1879. In 1887, the Chicago, Kansas and Nebraska Railway Company built a branch line north-south from Herington through Haysville to Caldwell. It was renamed in 1891 to Chicago, Rock Island and Pacific Railway which shut down in 1980, renamed in 1980 to Oklahoma, Kansas and Texas Railroad, merged in 1988 to Missouri Pacific Railroad, merged in 1997 to the current Union Pacific Railroad. Most locals still refer to this railroad as the "Rock Island". 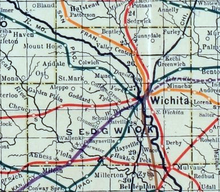 In 1903 a depot was opened and passenger trains shuttled people to and from Wichita. On May 3, 1999, a tornado rated F4 on the Fujita scale struck Haysville, killing 6 people. Damage to structures included 150 homes and 27 businesses. All of Haysville's historic district was destroyed. The only thing left standing on the east side of main was the original bank vault. Haysville is located at 37°33′50″N 97°21′11″W﻿ / ﻿37.56389°N 97.35306°W﻿ / 37.56389; -97.35306 (37.563787, -97.353044). According to the United States Census Bureau, the city has a total area of 4.62 square miles (11.97 km2), of which, 4.61 square miles (11.94 km2) is land and 0.01 square miles (0.03 km2) is water. Haysville Fall Festival. The annual three-day event takes place in and around Riggs Park. The Fall Festival celebrates its 30th year on October 17–19 in 2014. Village Christmas. Each year in the beginning of December. Celebrated in the Historic District of Haysville. Hot cocoa, carriage rides, choir performances, Santa, and more. Community Expo is held in April at the Haysville Community Library or Haysville Activity Center (HAC). Springnanigans is a festival for kids held in May in the Haysville Historic District. 4 July Celebration is celebrated in Riggs Park. Fireworks show in the evening. 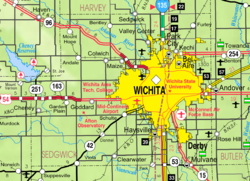 Haysville is part of the Wichita, KS Metropolitan Statistical Area. As of the census of 2010, there were 10,826 people, 3,857 households, and 2,932 families residing in the city. The population density was 2,348.4 inhabitants per square mile (906.7/km2). There were 4,087 housing units at an average density of 886.6 per square mile (342.3/km2). The racial makeup of the city was 92.7% White, 0.6% African American, 1.2% Native American, 0.9% Asian, 1.2% from other races, and 3.5% from two or more races. Hispanic or Latino of any race were 4.6% of the population. There were 3,857 households of which 44.0% had children under the age of 18 living with them, 56.0% were married couples living together, 13.9% had a female householder with no husband present, 6.2% had a male householder with no wife present, and 24.0% were non-families. 20.7% of all households were made up of individuals and 9.8% had someone living alone who was 65 years of age or older. The average household size was 2.78 and the average family size was 3.20. The median age in the city was 32.8 years. 30.4% of residents were under the age of 18; 8.8% were between the ages of 18 and 24; 26.9% were from 25 to 44; 21.7% were from 45 to 64; and 12.1% were 65 years of age or older. The gender makeup of the city was 48.0% male and 52.0% female. As of the census of 2000, there were 8,502 people, 3,021 households, and 2,350 families residing in the city. The population density was 2,422.8 people per square mile (935.2/km²). There were 3,167 housing units at an average density of 902.5 per square mile (348.4/km²). The racial makeup of the city was 93.86% White, 0.53% African American, 1.14% Native American, 0.53% Asian, 0.01% Pacific Islander, 1.41% from other races, and 2.52% from two or more races. Hispanic or Latino of any race were 3.20% of the population. There were 3,021 households out of which 42.4% had children under the age of 18 living with them, 62.0% were married couples living together, 11.1% had a female householder with no husband present, and 22.2% were non-families. 19.1% of all households were made up of individuals and 8.6% had someone living alone who was 65 years of age or older. The average household size was 2.78 and the average family size was 3.18. In the city, the population was spread out with 30.8% under the age of 18, 8.5% from 18 to 24, 28.8% from 25 to 44, 20.5% from 45 to 64, and 11.4% who were 65 years of age or older. The median age was 34 years. For every 100 females, there were 98.3 males. For every 100 females age 18 and over, there were 94.0 males. The median income for a household in the city was $46,667, and the median income for a family was $50,118. Males had a median income of $37,626 versus $23,681 for females. The per capita income for the city was $18,484. About 2.9% of families and 4.4% of the population were below the poverty line, including 4.8% of those under age 18 and 7.5% of those age 65 or over. The Haysville government consists of a mayor and eight council members. The council meets the 2nd and 4th Monday of each month at 7PM. City Hall, 200 W Grand. The city of Haysville is served by Haysville USD 261. Campus High School, located in Wichita, but serves as the High School of Haysville, Kansas USD 261. ^ Brackman, Barbara (1997). Kansas Trivia. Thomas Nelson Inc. p. 27. ISBN 9781418553814. ^ "Info on the May 3rd 1999 Haysville tornado". National Weather Service. Retrieved 23 September 2015. Wikimedia Commons has media related to Haysville, Kansas. This page was last edited on 27 February 2019, at 03:41 (UTC).